It all began from a personal mission statement written by Lee Hoedl while completing his collegiate studies: "It is my personal mission to inspire and enlighten the human spirit through image and word." From that early mission statement, has emerged numerous freelance articles and photography in national and regional magazines, self-authored books and hoedl's haven productions©. Still today, that mission statement by Lee holds true. Realizing the importance of key moments and memories in one's life, it is Lee's hope that each article/book, reflection, photograph and video speaks from the heart and moves the spirit. In 2004, in cooperation with Lifevest Publishing, Lee published I Have Just The Gift For You; a tale in which any parent might very well find themselves: the search for the greatest gift to give their child. He followed up with JESSE: The Wait of the Wood in 2006. Its message is simple: When the hand of the Grand Artist touches any life, no matter how royal or simple, it becomes and remains a “piece of the Master”; a “Master-piece” that must simply wait for its noble purpose and calling. And most recently, Lee teamed up with Lifevest Publishing again to share the story of Nathaniel; a simple message that reminds one and all of a message we all need to hear: " It's Okay, These Things Happen." A handful of photos, a few random CDs of digital images and an assortment of videotapes adorn your kitchen counter... but what next? There is nothing more frustrating than to have memorable unedited moments within your life, captured by photography and videography, and no idea on how to blend them together into a wonderful presentation to share with family and friends or save in your own family archives. 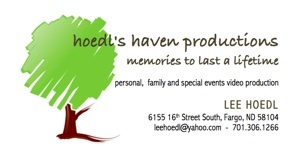 hoedl's haven productions© is committed to assisting you in creating a personal production that vibrantly captures your memories to last a lifetime. Click on the image below to get started on saving your precious moments.